Written for the curious. This is a short narrative by the author about the history of SwordSearcher. For a detailed list of what's been added in each release, see the revision history. By Brandon Staggs, designer and programmer of SwordSearcher and owner of StudyLamp Software LLC. Revised March 2018. 1994. We'll come back to this. 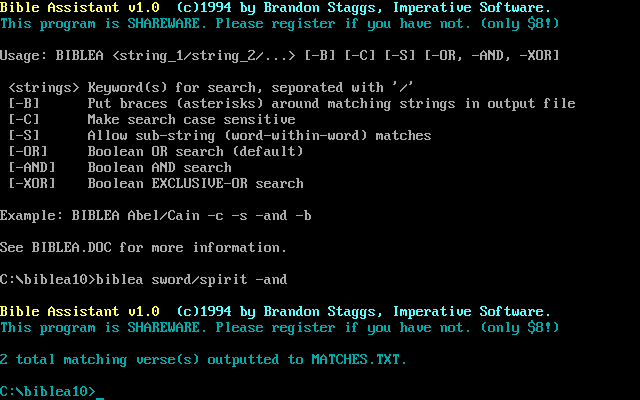 Screen shot of SwordSearcher 2.0 for DOS. Announced in 1994 and released in 1995, SwordSearcher 2 was written in Borland C++ 4 and was a mouse-driven MS-DOS program. There really weren't too many new DOS programs being released back in 1995, as Windows 3.1 had been around for a few years and Windows 95 was on the horizon. But I liked DOS, not Windows, so SwordSearcher 2 was a DOS program. It took up two 3.5" floppy disks. Mid-1995, I put out a call out on a Bible study email list for help in testing a new Bible program which would be designed specifically for the then-new 32-bit world of Windows 95. Armed with a few willing volunteers, I started out on a quest to create my first "real" Windows application. It would have all that I thought version 2 lacked. SwordSearcher 3.0 was called SwordSearcher95 (and was released in time to still warrant the '95). SwordSearcher95 later became SwordSearcher97, and subsequent releases dropped the year from the title. The final revision of SwordSearcher 3 was 3.4, released in 1999. Like version 2, SwordSearcher 3 was written in Borland C++. 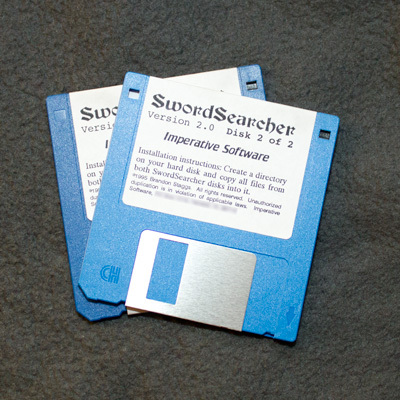 Originally, SwordSearcher 3 was distributed as a stack of floppy disks, which started at about 8 and eventually grew in size to over a dozen disks. Once CD-ROM drives started to become ubiquitous, SwordSearcher 3 moved to CD-ROM with an option to get floppy disks. We spent $500 on a 2x CD-ROM burner, and blank discs were over $1 each. After a few revisions, the size of the library grew too large to offer on floppy disks any more. Prior to version 3, SwordSearcher did not have any commentaries or dictionaries. SwordSearcher 4.0 was a completely new program written "from the ground up," released in 2001. It was developed continually for five years after that. 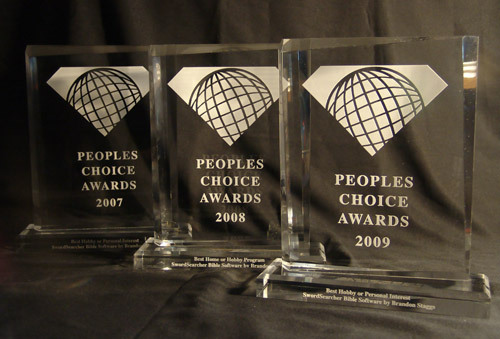 The final revision was version 4.8, released in February of 2006. When I say version 4 was written "from the ground up," I really mean it. Not a single line of code from SwordSearcher 3 was used in SwordSearcher 4. This was necessitated by the fact that I started using Borland Delphi as my programming language. But this wasn't an inconvenience—I had learned quite a bit since starting SwordSearcher 3 and wanted to redesign just about everything. SwordSearcher 4 kept the general layout of SwordSearcher 3, with one panel for Bible text, another for Bible search results, and one for commentaries. I added a separate area for topical information, since it is convenient to be able to study from a verse-based (commentary) resource and a topical one at the same time. One of my primary goals for SwordSearcher 4 was to make it easy to get to topical information "backwards." For example, it always bothered me that I couldn't go to a Bible dictionary and look up a verse, and instead always had to guess at what topics might be relevant to a verse. For example, if you're studying John 3:16, and I want to see what dictionaries and topical guides say about it, do I look up Salvation? Gift? Belief? Redemption? Why not all of them? And what about topics I may not think to consider, like Only Child? Sure, some printed dictionaries have a reverse index of Bible verses, but they are not always complete, and I wanted SwordSearcher to do all of that automatically. One of the first reactions I got from someone using SwordSearcher 4 was: "wow—the program is so alive now!" This was because each verse now had a margin area next to it with links that would let you quickly go to any book, topical guide, dictionary, or commentary that referenced the verse. SwordSearcher 5.0 was released in November of 2006. 1. More customization. I wanted users to be able to easily customize the layout of the display panels. Even floating them off the main display area if they want. 2. More flexible searching. I wanted SwordSearcher to be even more friendly to novice searchers: if they misspell a word to search for in the Bible, why not suggest alternatives? And for advanced users: give them more power, with full boolean expression evaluation and various token modifiers to make it possible to describe very complex search parameters. Thanks to having a lot of really good beta testers -- people who tested each new build after I worked on it, and told me where I went wrong -- it came out better than I had originally planned. Having a variety of testers made it possible to make things easier for beginners, and at the same time, offer advanced and power users even more capabilities. There were a lot more "little" things done for 5.0 than the two listed here, but those are the highlights. 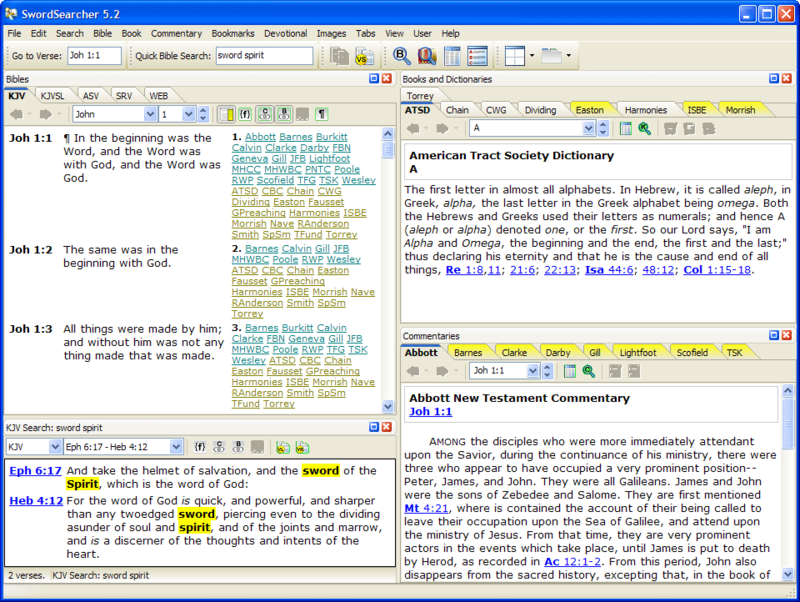 The year 2010 marked the 15th anniversary* of SwordSearcher Bible Software, and the release of SwordSearcher 6.0. An extensive update to version 5, version 6 further expanded the customization features introduced in 5.0, adds several new search tools, more personalization options, and clone panels. In version 6.1, support for integrating MP3 audio Bibles right into the Bible panel was added. Innovation continued in version 6.2 with features like StudyClick. *15 years from 1995, when the first version of the software with the title "SwordSearcher" was released. 2013. Lots of "under-the-hood" improvements make possible powerful new search capabilities with the unified search bar, which provides automatic phrase suggestions, spelling corrections, and other useful tools as you type. New visualization tools like the Bible Word Cloud Generator offer more unique Bible discovery options. The icons have been renovated, with subtle changes to give SwordSearcher a new "straighter" and clean modern look. 2016. A complete overhaul of window and text rendering to support modern high-DPI screens and 4K displays, for crystal-clear razor-sharp text on new computers at any scaling level. Added an interactive bar graph to search results and a "concordance style" optional viewing mode. A reverse-interlinear format for the KJVSL. And the most significant advancement for scripture-with-scripture Bible study: The Treasury of Scripture Knowledge has been integrated in-line right into the Bible text in the new KJV-TSK Bible module tab. The library included with SwordSearcher has grown to over 100 titles (literally hundreds of print volumes), but the focus remains on creating features for study of the Bible itself. Version 8.3 is the current release (2019). SwordSearcher is still being actively developed! There is always more that can be improved. So, where is SwordSearcher 1.0? 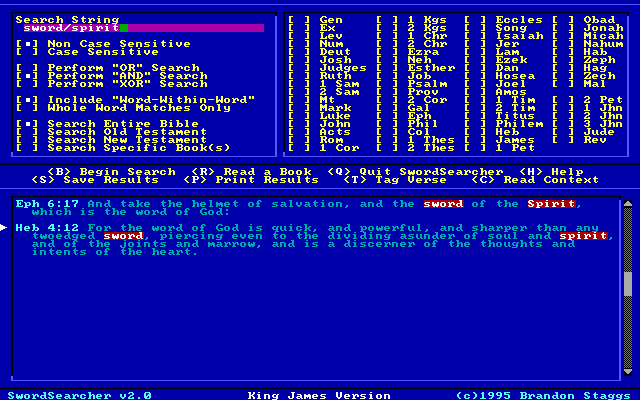 SwordSearcher 1.0 was called Bible Assistant and was a command-line-only DOS program designed to simply save verses from the King James Bible matching a search word to a text file. (This was something like a specialized "grep for the Bible.") It was released in 1994. 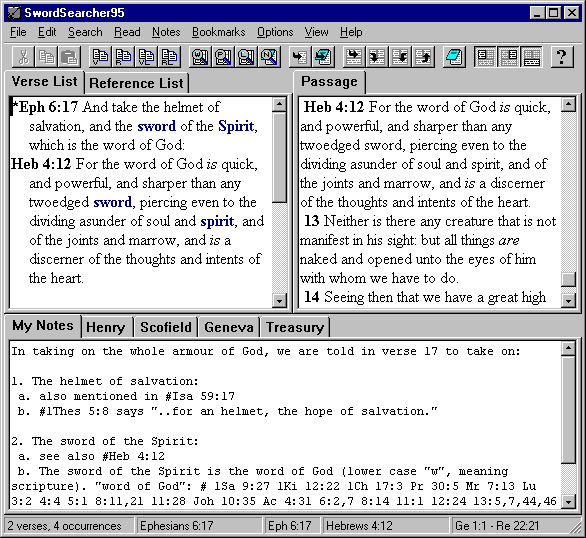 A mouse-driven interface was developed and added to Bible Assistant and the name became SwordSearcher, which was released as version 2.0 in 1995. The name SwordSearcher is one I came up with in 1994 while reading Ephesians 6:17, and is advertised as "coming soon" in the Bible Assistant documentation. Back then, using the name Sword in reference to Bible software was actually a new idea! I never developed software for Windows 3.1. Until Windows 95 came along, I didn't care at all for Windows as a development target. However, SwordSearcher 2.0 for DOS included an icon and shortcut configuration file for Windows 3.1 users so they could easily launch the SwordSearcher DOS program from the program manager. 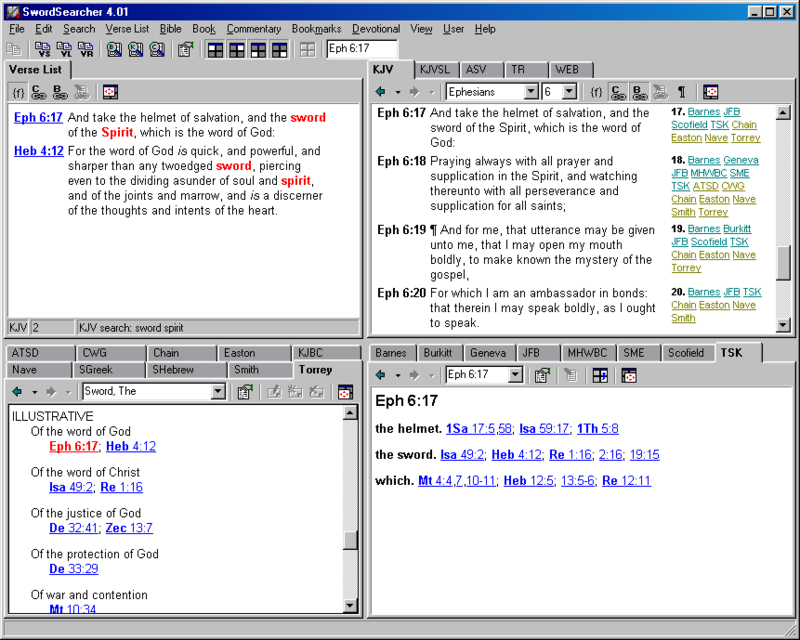 So there you have it: a quick, brief history of the development of SwordSearcher Bible Software. What's not mentioned here are the many different study resources that have been added with each release. You can see those on the revision history list.